Parties that involved in a project often have various requirements. It is difficult to understand and document the requirements of a project. Therefore, project teams spend most of their time communicating by clarifying the “requirements” of various participants. Stakeholders are people or groups that can effect or be effected by the outcomes of a project. Employees, directors, goverment, investors, communities are the examples of stakeholders. They may have positive or negative impacts on a project’s goals and objective. Stakeholders requirements and expectations can be different based their level of interests on the project. In this article we will discuss stakeholder analysis and stakeholder management. Below steps are recommended for a successfull stakeholder management process. All the projects have internal and external parties that interest in the outcome or the product of the project. These parties often change or their interests change as the project progresses. This cause various technical or other requirements which the project team may have assumed to be stable. In project management, the term stakeholder is used to describe individuals, groups, or organizations which have interests in the outcome of the project. They may have power or influence to supply resources to affect the projects outcome. Stakeholders can be individuals who are involved in the project actively. Stakeholder analysis and classification process comes after completing the stakeholder identification process. Project teams employ various tools and techniques to perform stakeholder analysis in order to understand the needs and expectations of parties inside and outside the project. Understanding their attributes and interrelationships may be helpful to plan and manage the project strategically. Stakeholder classification aims to group stakeholders according to their power, level of effect and influence on the project. Stakeholders are classified according to their power and level of interest on the project’s outcome.Power/interest grid can be used for classification. Stakeholders are classified according to their power and level of influence on the project’s outcome. Power/influence grid can be used for classification. Stakeholders are classified according to their influence and impact on the project’s outcome. Influence/impact grid can be used for classification. Stakeholders are classified according to their power, urgency, and legitimacy. Salience model can be used for classification. 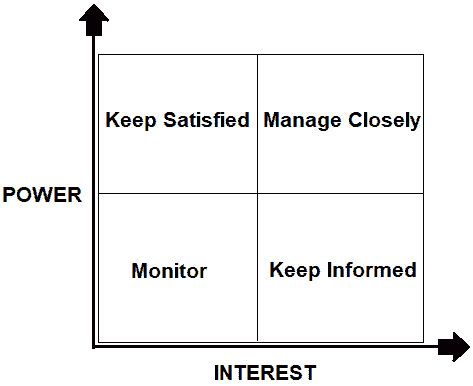 Power and Interest model is the most common model used for stakeholder classification. In this model there is a chart with x and y axis, where the x axis represents the degree of interest and the y axis represents the degree of power. Stakeholders with a high level of power and interest are on the right top of the matrix. They may be strongly supportive or otherwise. Since their interest is high, they have opinions. Stakeholders with a low level of power and interest are on the left bottom of the matrix. They may have no strongly formed views. This matrix provides you a basic analysis which helps you to create your basic management and communication strategy. In this model, stakeholders can be grouped in four classes. Stakeholders with high power and high interest should be managed closely. If they are positive and supportive, you can provide information and maintain their support. If they are negative, be careful and put effort into dealing with them. Stakeholders with high power and low interest should be kept satisfied. Because they have power. If their interests change over time, they may have positive or negative effects on the projects goals. Stakeholders with low power and high interest should be kept informed. If they are positive, use them to lobby other stakeholder groups and mantain their interests. If they are negative, don’t spend too much time with them. Stakeholders with low power and low interest should be monitored. If they are positive, provide them information because their position may change over time. If they are negative , don’t spend too much time with them. Like other models, power and interest model is helpful for managing stakeholders and their requirements. Establishing and efficient stakeholder management strategy is important for saving time while managing stakeholders. Because a project manager can not make the same effort while managing stakeholders with different priorities. Inherently, managing stakeholders with high power and interest is more time consuming than managing stakeholders with low power and interest. Project comunications plan helps the project team to understand which stakeholders they need to communicate. Especially in complex projects, communications plan helps to define communication routes. Stakeholders are those who have a particular interest in a project’s outcome. They affect or may be affected in some way from the project. They will be supportive if they obtain benefit from the project, conversely, if the project has negative impact or damage their interests, they will seek the ways to stop it. Therefore, stakeholder analysis, classification and management are the important processes which helps to enhance a project and receive support from the stakeholders. Establishing good communication channels with the stakeholders brings a project to a successfull conclusion. In this article we discuss stakeholder analysis and stakeholder management. Note that this is an important concept for passing the PMP Certification Exam.